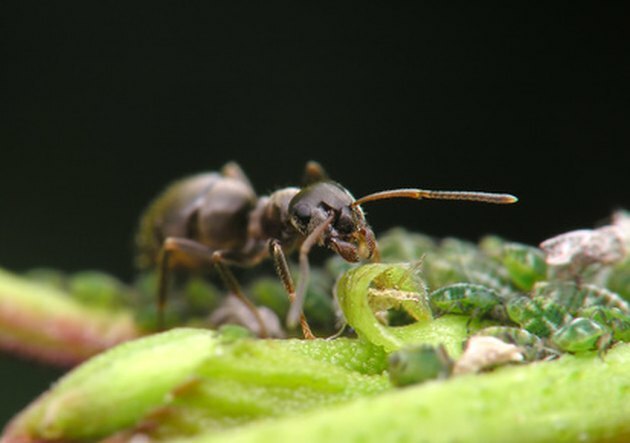 Ants are annoying pests that love the garden area--often getting a taste of your fruits and vegetables before you. Using pesticides in the garden isn’t the ideal way to get rid of the ants, because the chemicals can get into your food. Not only do you poison the ants, you also poison beneficial bugs and animals that you need in your garden to control other pests. There are natural methods that can eradicate or deter ants without using harmful chemicals. Getting rid of ants in the garden, the natural way. Crush up some chalk. Sprinkle the chalk in a line around your plants or around the perimeter of your garden to keep ants away. Ants will not cross chalk lines, according to Golden Harvest Organics. If you don’t have chalk, buy ground cinnamon, cayenne pepper, curry powder or baby powder and use them the same way. Reapply as needed or after a rain. Pour boiling water into ant hills. Dig up the homes to expose as many ants as possible and pour the boiling water over the top of them. The boiling hot water will kill ants. You may need several applications to kill all the ants. Sprinkle diatomaceous earth or bone meal throughout your garden area. Diatomaceous earth is fossilized algae that cuts through the exoskeletons of the ants. Take enough cuttings from catmint, peppermint or sage to fill an 8-oz. cup. Add this to 1 qt. of boiling water and remove from heat. Let the mixture cool and then strain. Pour into a spray bottle along with 1 tsp. liquid dish soap or coconut oil. Mix and spray the plants in your garden. Reapply monthly or after a rain. Sprinkle dry grits around the plants. The ants will eat the grits, which swell within their bodies, making them unable to digest their food. Cover the area around the plants with cucumber peelings. Cucumbers have a natural compound, trans-2-nenenal, that repels ants. Plant catnip, pennyroyal, sage, peppermint or spearmint--the plants are natural ant deterrents.